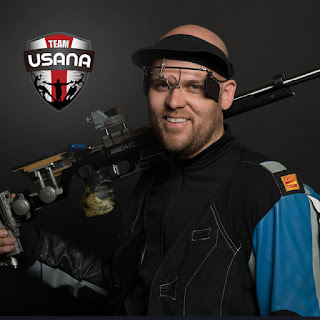 USANA Australia is excited to welcome Olympic rifle shooter Will Godward to Team USANA. Will, who is currently ranked #2*, has qualified for the 2016 Rio Olympic team and has started to prepare himself for the tough competitors ahead. USANA looks forward to supporting him every step of the way with his nutritional needs. Will said he is excited to “have the privilege of becoming a USANA team member”. Will got involved in shooting when he was 12-years-old in his home town of Moonta, South Australia. It wasn’t until he witnessed Michael Diamond win Olympic gold on 1996 that Will was inspired to one day become an Olympian and stand on the finishing podium. Since then Will has gone from strength to strength. He was the National Champion in 2008 and set 12 national records. Once Will realised he had exceptional competing skills he started to vigorously train for the Commonwealth Games in 2010. After competing in his first major competition, the Olympics were his next step and Will participated in the 2012 London Olympics and finished 40th. Will said making the Olympic team in 2012 has been his greatest honour so far. Aside from shooting, Will also has a strong passion for music and is a practising pianist. He began playing when he was 7 and has performed at the Adelaide Conservatorium of Music. USANA wishes Will good luck in the upcoming Olympics.